An antique oak pedestal table is a favorite piece of antique oak furniture for collectors. It is a must have for owners of Victorian houses and withstands daily use unlike any other piece of antique oak furniture. Antique oak pedestal tables have beautifully polished tops and massive carved claw feet. The antique oak pedestal table is perfectly round, and typically 42 inches in diameter, and will extend to six feet when opened out. 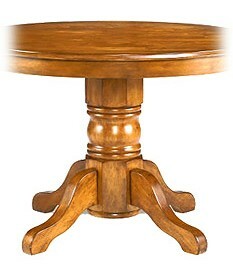 Find pictures of antique oak pedestal tables here. Recreate this elegant daybed ornately decorated with gilt ornaments and lush draperies.